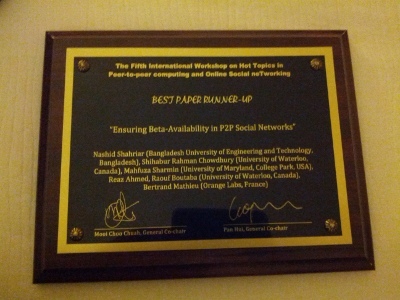 A paper entitled "Ensuring Beta-Availability in P2P Social Networks" of Nashid Shahriar, Assistant Professor, Department of CSE, BUET, Dr. Reaz Ahmed, Mahfuza Sharmin, Shihabur Rahman Chowdhury, former faculty members of the Department of CSE, BUET has been awarded the Best Paper Runner-up Prize on the Fifth International Workshop on Hot Topics in Peer-to-Peer Computing and Online Social Networking (HotPOST’13) held in conjunction with IEEE ICDCS 2013 at Philadelphia, USA. In addition to them, the paper was co-authored by Professor Raouf Boutaba of University of Waterloo. The details of the award can be found here. The paper is mainly about improving the availability of the contents of a social network deployed over P2P architecture.